In the 36th issue of the Bed and Breakfast Traveller, we take you to Revelstoke, BC, where you find alpine paradise at your backdoor! Come play with us in Revelstoke! Nestled between the spectacular Selkirk and Monashee Mountains, Revelstoke offers full visitor services in our charming downtown area. Quaint boutiques, casual coffee bars and restaurants are all within easy walking distance in Revelstoke. And, Revelstoke is home to some of the best adventure recreation opportunities in the world! Hiking, mountain biking, fishing, caving, hot springs, heli hiking, canoeing, the list goes on and on. In the winter months, Revelstoke has world class snowmobiling, heli and cat skiing and the best backcountry skiing anywhere. Fishing opportunities offer everything from fly-fishing alpine lakes to deep water trolling. Fly fish from a float tube in a small mountain lake, or troll for a monster Rainbow Trout or Dolly Varden in Lake Revelstoke or Arrow Lake. Lake Revelstoke area has held a world record for Dolly Varden (24+lbs.) There are many species in this area, including Rainbow, Brook, Cutthroat and Bull Trout, plentiful Kokanee (landlocked salmon), and large Burbot (ling cod). Hike along one of our many creeks & rivers to find the perfectly secluded spot. Many of our mountain lakes have BC Forest Service recreation/camping sites, making for convenient access and camping/picnicing areas. The Selkirk & Monashee Mountains that surround Revelstoke offer endless hiking & climbing opportunities. With many area mountains topping 10,000 ft, you have the opportunity to climb on glaciers and high alpine meadows, either by hiking up marked trails, or taking a ride in a helicopter to some very remote & untouched wilderness areas. Imagine being whisked away by helicopter to a high alpine summit to spend the day hiking or climbing in incredible, unspoiled mountain wilderness. Whether you are looking for an easy hike or some extreme high altitude rock climbing, we have you covered. When you go mountain biking here in Revelstoke, you will experience what real "mountain" biking is. The area has a large networks of trails, as well as a variety of rentals & guided tours. We have so many trails, you could ride every day all summer, and never ride the same one twice! If you are looking for a more casual ride, there are trails along the Columbia River, and through the "Greenbelt" park right in Revelstoke. Splash through the rapids of one of our glacier-fed rivers for a challenging whitewater kayak adventure! The Illecillewaet River is the Revelstoke area's best kayaking river. Whitewater rafting is also very popular on this river. If you are looking for some gentle paddling, try the Columbia River, Upper Arrow Lake areas. 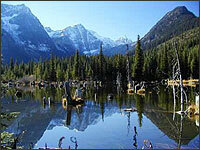 Several mountain lakes are easily accessed, and provide a secluded place for fishing, picnicking and exploring. Revelstoke has many major attractions for you to enjoy. The Revelstoke Hydro Dam has a very interesting self-guided tour, including many displays, exhibits, and even a lookout from the top of the dam. There are now three different Hot Spring Resorts in our area. Cabins, camping, whitewater rafting, boating, and horseback riding are also available at these locations. Enjoy the warm, soothing, healthful mineral waters of our region. 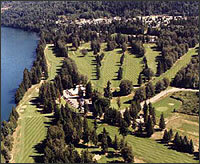 One of Revelstoke's best kept secrets is our 18 hole, riverside golf course. With the majestic Monashee and Selkirk Mountains as a backdrop, the Revelstoke Golf Club was established in 1924 and it has been described as "a gem of a course". Right in the middle of our historic downtown is Grizzly Plaza. During the months of July and August, there is free nightly entertainment from a wide variety of talented performers. Drop in any summer evening and check it out the fun. All Aboard! Take the track to Canadian Railway History. Visit Canada's unique Railway Museum with an unbelievable selection of memorabilia, a fully restored Steam Locomotive, and much, much more...Today there are many ways to explore our rich heritage. On November 7th, 1885, Hon. Donald Alexander Smith drove the last spike to complete the trans-continental railway. Visit "The Last Spike" at Craigellachie (south of Revelstoke on Hwy 1), a milestone of Canadian history. Self guided Walking and Driving Self Guided Tours identify some 60 historic buildings. A brochure is available at the Revelstoke Museum and the Visitor Info Centers. The Revelstoke Museum has a large amount of historical items & artifacts for you to explore. The Firehall Museum features a fully restored 1923 International Bickle Fire Engine, as well as many more interesting items. The B.C. Interior Forestry Museum features a visual and historical depiction of forestry in Revelstoke and the Province of BC. We have a wide range of places for you to stay while vacationing here in Revelstoke. We have full-service winter RV camping facilities available. There are many hotels and motels here to cater to your every need. Everything from budget accommodations to the deluxe services of a luxury hotel. Several cozy bed and breakfasts populate the Revelstoke area. Enjoy the personal service and friendly atmosphere they provide. Revelstoke is home to several world-class resorts, providing accommodation with a variety of other activities in one location. Stay in a luxury suite or in a cozy back-woods chalet. If you are looking for a special dining experience, Revelstoke has several Fine Dining establishments or try one of our many Family Restaurants. There are many cooking styles to choose from, such as Oriental, Italian, German, Greek, or Western Cuisine. For a quick meal, try one of our various Fast Food restaurants. Great for something on the go! Our Specialty Coffee and Lunch Bars will give you a warm welcome and a wide variety of coffees, pastries, desserts, or a delicious light lunch.
. The Best Time of Your Life. Come play with us! Description: Learn more about the Forestry Revitalization Plan. Sample some forest history from the Royal BC Museum. The kids can make paper, and sort logs with a remote control boom boat. And lots more to see and do. Description: Revelstoke's famous ball tournament celebrates it's 16th year! 140 teams competing for the coveted tournament championship. Live entertainment, great food, dances, fireworks and much more. Lots of fun whether you play ball or not. Description: Cops for Kids is an annual cycling tour that raises funds and awareness for Sunshine Dreams for Kids. The ride team members are RCMP officers that donate their time to ride. Description: Fringe theatre, music, art shows and demonstrations, street performers, clowns, Saturday night comedy cabaret, artisans on the street, farmers market etc.